Boost your holiday spirit by practicing gratitude meditation. Learn how simple mindfulness techniques help us stay grounded and inspire a positive outlook. 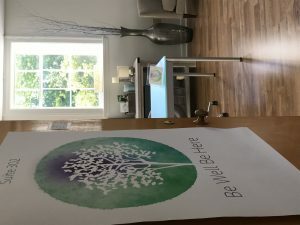 Discover your way to incorporate mindful wellness practices into daily life for greater joy, relaxation, courage, and well-being. This FREE event is our holiday gift to you! 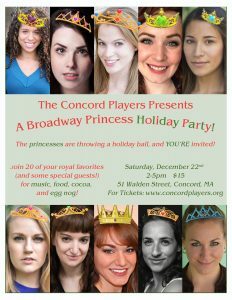 The Concord Players presents A Broadway Princess Holiday Party! The princesses are throwing a holiday ball, and YOU’RE invited! Join 20 of your royal favorites (and some special guests) for music, food, cocoa and eggnog. It all takes place Saturday, December 22nd from 2-5 pm at 51 Walden Street, Concord. Tickets are $15; to reserve your spot, go to www.concordplayers.org.